I’m often greeted with, “Oh, you are actually in town?” “How long are you in town for this time?” or “Where to next?” My travel schedule has certainly become the laughing-stock of my friends. But, what can I say, I come by it naturally. I’m the daughter of two jet-setters. My dad logs more frequent flyer miles in a week than most people do in a year. My mom’s flown 35 consecutive months, 10 of those were international flights. I’ve been traveling since I was a baby, and despite my face below – I love it. I love the exhilaration of being in a new place as well as the familiarity of coming back to a place I’ve been dozens of times. But for us, traveling has become so much more to our family, than just another fun trip. Clearly, we choose to spend a chunk of change on our traveling, but we look at it as a sort of investment and we’re hoping the return will be worth it. Here are the top 5 reasons our family chooses to keep traveling. 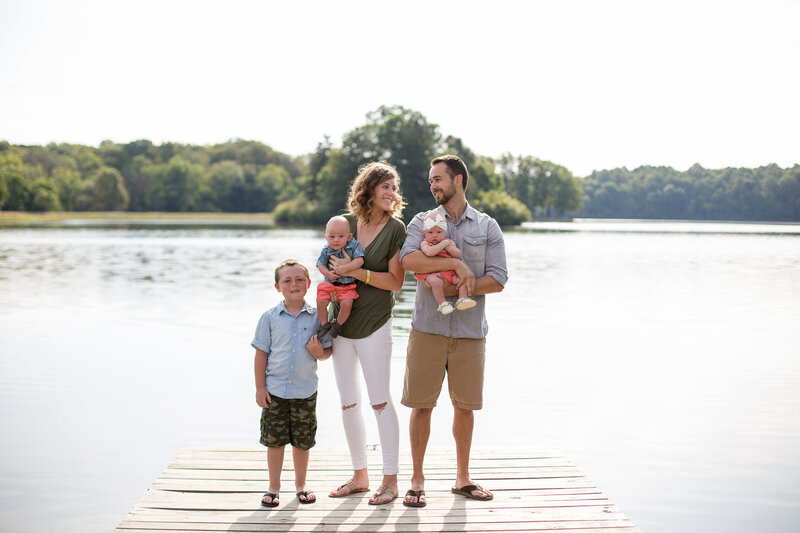 “Our goal in parenting is not ultimately for our kids to get a great education, or to be great athletes, or to find great spouses, or to get a great career. Our goal is for them to love a great God.” (David Platt). I’m a firm believer that you can point to the greatness, faithfulness, and to the depths of God’s love everywhere you go and in everything you do. But there is something incredible about seeing the different pieces and parts of Him displayed throughout the various parts of creation. Through our travels we have been able to interact with different animals allowing us to see God’s hand in even the smallest details of their design. I hope my kids never stop marveling at the works of their Creator. My parents are thousands of miles away from me. So are my brothers, my grandparents, my aunts, my uncles, my cousins. I can’t figure out why everyone is so reluctant to trade sunny Miami and Los Angeles for northeast Ohio. I mean, they are practically the same. I attended college in West Palm Beach, Florida. My family had relocated from Miami to Ohio at the time. But my grandparents still live in Miami and so I started spending weekends there. It started because the laundry fairy kept showing up. I would come home with a bag of dirty clothes and then magically leave with a bag of clean clothes, and a couple of twenties slipped in my coat pocket (thanks Grams!). After a year, I decided to relocate to Ohio to be closer to Jimmy (we were dating long distance at the time). I lost my granddad shortly after. That time in West Palm quickly became some of the most treasured moments of my life. I was present for what would become my last moments with my favorite human, and that’s something I’ll never take for granted. FaceTime and phone calls are awesome, but time spent matters. Granddad was the one that started our frequent trips to Disney. He’s been gone for over 9 years now, and I still can’t walk into a Disney park and not be flooded with memories of him and I there. And it isn’t the rides, or shows I’m remembering, it’s walking hand in hand with him, to sneak a Mickey bar before dinner. It’s him and I there, together, that I cherish. 95% of our trips involve time with family. Whether we make a pit stop in Miami for Sunday Night Dinner at Nana’s, or have my parents with us as we explore a new destination; I’m determined to make the most with the moments we have. I don’t know if my kids will remember dining with Minnie Mouse at Disney, but I know they will remember the time Grams dressed up as Sorcerer Mickey, and let them ride on her electric scooter through Mickey’s Not-So-Scary Halloween Party. Like I said earlier, I want my kids to live in awe of their Creator, and the best part of His creation is the people, and the uniqueness and intricacy in which He created each of us. New places bring new people with all different backgrounds, histories, and experiences. I want them to be inspired, to be challenged, and to be motivated, by how amazing people across this globe are. Not only do I want them to gain appreciation for people’s differences, but I want them to gain perspective. I want them to learn why it’s important to give back. I want to cultivate a heart of thankfulness and radical generosity. I want my kids to experience everything, heck I want to experience it all. I want them to learn about the world through all five senses. To see the turquoise waters of the Caribbean, to hear the sound of a rushing waterfall right before you jump off of it, to taste the food of every culture, to smell a field of wildflowers, to feel the wind in your face as you zip line over the rainforest. I want them to learn the best views come after the hardest climbs. To be brave. To stay wild. And to never lose their thirst for knowledge and adventure. People always ask how my kids are so flexible. To be honest, I haven’t given them much choice. Because we are often on the go, they’ve had to adapt to time changes, different sleeping arrangements, climate changes, and plenty of schedule deviations. Don’t get me wrong, we have our fair share of meltdowns and sleepless nights, but they continue to increase their adaptability. Traveling takes a lot of planning and preparation. And although we put the time in, plans rarely work out exactly right. There are plane delays, traffic, unexpected weather, illness, and then there are boats that catch on fire in the middle of the ocean while you are still on it (yep, that happened). Each of these events is an opportunity. Little eyes take notes about how we respond when we miss our flight. And what happens when rain ruins our outing. My mom always said to us growing up, “life is 10% situation and 90% attitude.” Part of traveling is teaching my children that you can’t control everything but you can control how you respond. Oh, how I’ve enjoyed some of these adventures with you! You bring life everywhere you go! Travel is so important and I loved learning your reasons for travel. May the road be endless! I love that: “May the road be endless!” Thanks! Holly! I adore your blog! I think we could be pretty good friends 😉 You write in such an encouraging way. My husband and I are sitting here reading it together and we are so impressed with how you seem to take every opportunity to speak scripture over your littles. So admirable! Love your blog and look forward to seeing more posts! Thank you for this comment! It’s always nice to hear kind words!!! This really made my day. Well said! We are so lucky to be alive, but often we overlook the beauty around us…whether it is a location or the people around us. We also traveled a lot as a family when I was young and our greatest memories weren’t always about the location but about our time as a family. It sounds as if you had a blessed childhood and you are passing this love on to your kids. Many blessings on your continued travels! Yes, its so easy to become desensitized to the beauty around us! It takes an intentional mindset to counteract that! Thanks for your kind words! First of all – JEALOUS! So want to see the world and it looks like I’m waaay behind! Love that you are teaching your children such important life lessons and creating memories. Really enjoyed! It’s never too late to start! Start with your local city – find new places to explore and then spread out from there! Start small, dream big! great article. I too love to travel with my family and embrace of all God’s amazing creation. Pingback: Why travel with kids?